We present a full evening of entertainment from prominent artists and performers, who will raise the roof for Palestine in protest of Eurovision taking place in Tel Aviv, Israel! Join us in supporting the call from the Palestinian people to Boycott, Divest and Sanction (BDS) Israel until Palestinians enjoy the same rights and freedoms that belong to all of us! 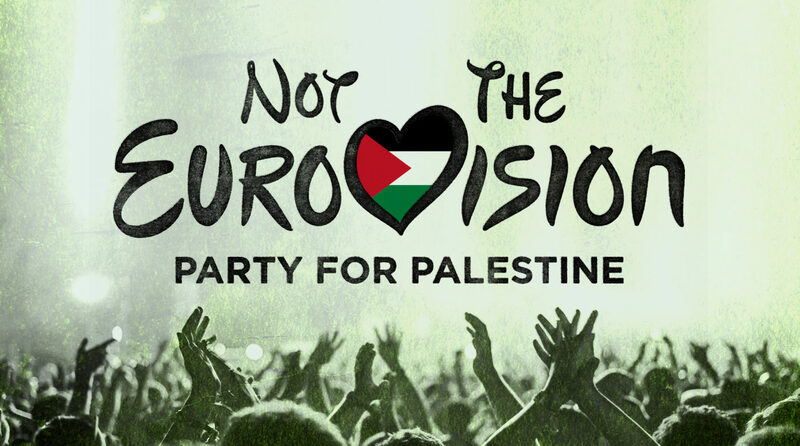 Join the Party for Palestine and protest Eurovision taking place in Israel! Having opened for US Hip Hop heavyweights including Wu Tang Clan, The Game, J.Cole, Slaughter House, Talib Kweli & 2 Chainz, Mic Righteous‘ debut EP Open Mic went straight in at No.1 in the UK Hip Hop charts and No.2 in Ireland, Australia and Sweden. Fresh from being on Charlie Sloth’s Fire in the Booth, Mic Righteous is rebranding himself as Mic Rickless. Known for his heartfelt lyrics and powerful flow, Mic Rickless is undoubtedly one of the best rappers of our time! An evocative North London alt-rock outfit, Wolf Alice deftly mixes folk, grunge, and electronic elements with vintage ’90s indie rock. The band’s second studio album, Visions of a Life, It debuted at number two on the UK Albums Chart, received universal acclaim from music critics, ranked as one of the best albums of the year by multiple publications and won the 2018 Mercury Prize. They are known supporters of Palestinian human rights and the BDS movement. This will be a rare opportunity to see them perform an exciting DJ set! Dave Randall is former Faithless guitarist and bandleader of Slovo. He produced the campaign song ‘Freedom For Palestine’ and wrote the book ‘Sound System: The Political Power of Music’. He kick things off with some globe-trotting quality dance-floor fillers. Hawiyya Dance Company was founded in 2017 as an all-women’s collective, based in London. Their main focus is raising awareness on the occupation and oppression of Palestine. They unite and build on promoting the Palestinian struggle for equal rights, their right for freedom and the narrative that is all too often silenced. Hawiyya draws upon Dabke (Laventine Traditional Folk Dance) with Contemporary Dance to create narrative works that tell stories of the oppressed and of the resistance that is lived. Hawiyya endeavours to honour Palestinian cultural through the celebration of Dabke in performance and participation.